France is a vast and underpopulated country. Immense stretches of territiory, especially in the mountainous parts, are largely unfrequented. During the past 50 years, these territories have been made accessible by a network of "sentiers de grande randonnée" (GRs) or long hiking trails, marked out by red and white signs, which enable France to be crossed on foot and link up with paths elsewhere in Europe. There used to be lots of donkeys in France because they worked on farms. But by the 1970s, there were practically none left. So some people thought up a way of giving this animal a well-deserved new image. 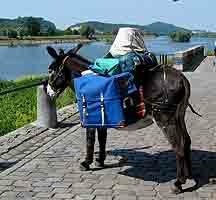 This was the idea : provide donkeys for country walkers, to carry their luggage and give small children a ride. Like that, a rambling holiday is feasible even with a young family.And with all the pleasure of walking through beautiful scenery, in the country or the mountains, with no danger for the children. The donkey is a very gentle creature. Legend has it that it is stubborn, but this is totally untrue. 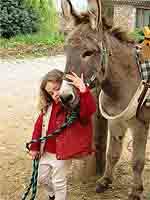 The donkey gets on very well with children, who look upon it as a rather large pet. Many a pang in the heart is felt on taking leave of this friendly animal at the end of the journey. Happiness is walking with a little donkey companion. It means going slowly, exploring a region in depth. It means recalling feelings from childhood days. 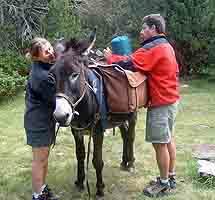 Today, there are over 300 professional donkey hirers in France, Belgium and Switzerland. Many donkey hirers also run lodges or guest rooms for holiday-makers. They may also provide good, home-cooked meals. So you can spend the night on the spot and leave with the donkey the next day. If no accommodation is available, your donkey owner will give you the addresses of the best near-by lodgings. A donkey is usually hired for either one or two days or for a week, but possibilities are many and various. The donkey hirer prepares your itinerary and provides a map to help you find your way. Coloured marks often indicate the paths you are to follow. The hirer will explain how to handle the donkey and give all the advice to make your tour a success. 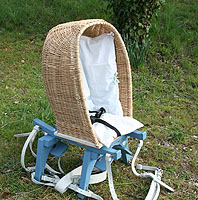 With the donkey come a pack-saddle and bags for your luggage. 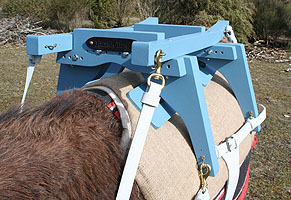 The maximum advisable weight on the donkey's back is 40 kg. You can spend the nights either in your tent surrounded by nature or in a hotel or guest house. Often the hirer will make the necessary reservations. 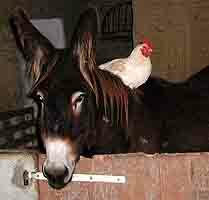 The donkey you reserve can be paid for by bank transfer in the Eurozone. 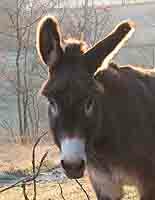 If you wish to find out where you can spend a wonderful holiday with a long-eared companion, click on the little yellow donkey. 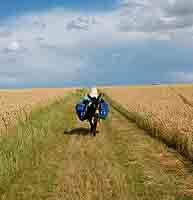 You will find a list of donkey hirers and the English-language page of each one.